I had the pleasure of SySy’s company yesterday in the air over in the sim next door to The Arcade. That is right, if you have been living under a rock the past few days, the long awaited return of this Gatcha event is back, and back strong. The sim has been full to overflowing for days since its opening, and it is no wonder with dozens of stores participating, more than actual avatars allowed on the sim. I do love the placement of the event though, you really do get to take advantage of the surrounding sims air space and the handy draw distance options we have in our viewers. Do make sure to uncheck the limit select distance option in advanced settings when you do though, otherwise nothing will work for you, and you may think it is because you are too far away. While there I was lucky enough to get this adorable Doll Head by Fashionably Dead in the rare bunny option first go. Now I was totally stoked with whatever I was going to get, but I will totally admit to being even more impressed at the options. This head doesn’t just come as is, you get tone options, brow options and eye colour options, when you click on it and choose appearance from the menu. This is great, as it can help you get closer to a skin tone you have, as skin is not included. I did however just fall for the big beautiful dark brown eyes, so left them as the default, but do play around with it, and even if you get the same one as your friends, now you know you can still be different. Another great thing, was that the ears also change colour or texture, so I went with the black to match my new Hathaway hair by Tableau Vivant for Collabor88 this round. This hair is a nice short style, that would actually suit males as well, and defnitely be cute on some little ones I am sure. The hair is n0 mod, which I found surprising with unrigged mesh, but you can use the resizer to get a better fit, I just hit plus 10 a few times to get it big enough for my Doll Head. Now a good bunny knows that plants and flowers aren’t just food sources, but can be charming accessories, such as this lovely floral headpiece by Glam Affair, also a C88 item. It is available in various colours, but as soon as I saw the beautiful lace top in white, I was sold on a black and white look. The lace top is actually a top that goes over a lovely floral dress by Nylon Outfitters, also at C88. The only problem for me, is that the dress only has two sizes for the mesh portion of the dress, and the small was not small enough for my shape. I do recommend trying it though as it is a lovely set, but even if it doesn’t fit I would suggest grabbing them just for the lace top part, as well as the floral upper to the dress, as I was able to mod that shorter as well to fit underneath for another time. For this occasion though, I went with the black bra from Maitreya, which is a bustier style bra top, and then the new BOOM skirts called Minka that are you guessed it, C88 items. Now you cannot really see this skirt, as I am sitting on most of it, but it is a great tiered mini with a bow belt in white around the waist. It is also high-waisted, so you may need to go up a size depending on which standard sizing you use. The fabric that is used for the skirt is a stunning velvet look, so I can see this being a go to skirt for many. 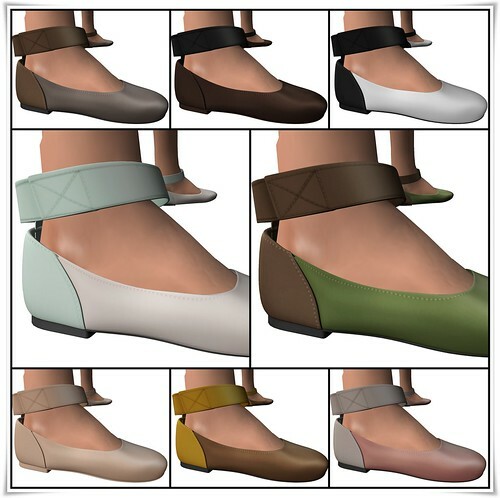 Now the finale of this post is definitely the beautiful new ballerina flats by Tee*fy. These Arden flats come with or without the straps around the ankle, but I cannot imagine why you would want to wear them without, when you can wear them with…of course I do sometimes just like a simple flat, but honestly the straps are adorable. There are 8 great colours to choose from, and they are more of a colour blocked kind of mix, so you will have to just get them all I think.